The Fountain is an overwhelming experience thought out by the well-known director Darren Aronofsky, responsible for such great movies like PI (one of my all-time favorites) or Requiem for a Dream. In parallel to (or even before) finalising the film "The Fountain" he published the graphic novel, winning the painter Kent Williams for doing the great artwork here. For sure the intense drawings, sometimes looking more than arty sketches, contribute to the fantastic overall impression this book leaves on the reader. So you can't stop to feel with the main character Thomas on his epic journey striving to discover the main secrets of life. In three different ages - as an adventurer, as a scientist and as a explorer - he tries to discover, to force and to overcome life, love and death. Does he have to fail? This fall, Darren Aronofsky - the acclaimed director behind such critically acclaimed films as Pi and Requiem for a Dream - releases The Fountain, his most ambitious movie yet. 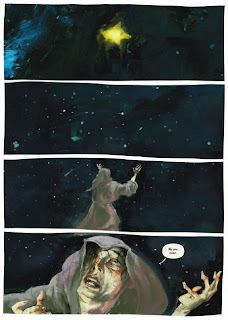 Now, in time for the film's greatly anticipated debut, is the softcover edition of last year's sought-after THE FOUNTAIN graphic novel, which earned artist Kent Williams (Blood: A Tale, Havok/Wolverine: Meltdown) an Eisner Award nomination for Best Painter. 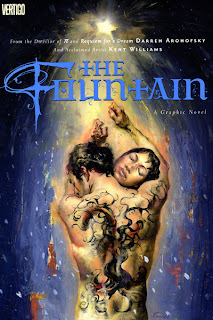 The Fountain graphic novel is a sister-project to the film, which is released by Warner Bros. Pictures and Regency Enterprises and stars Tony-Award-winner Hugh Jackman (The Boy from Oz, X-Men) and Oscar-winner Rachel Weisz (The Constant Gardener, The Mummy). Using the same story as its seed but stretched instead upon the limitless canvas of the comics medium, the graphic novel provides an insider's accompaniment to the movie, providing perhaps the ultimate "director's cut.